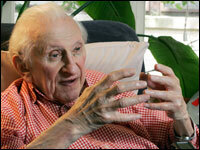 Just heard on NPR that celebrated populist oral historian and radio personality Studs Terkel died today. “Curiosity did not kill this cat,” is what he said he’d like his epitaph to read. I might have to steal that! yeah, studs was a stud. that quote is great. he will be missed. google his face for a picture of him tipping back a beer at age 93.
cool I’ll add his photo to this post. That quote just really spoke to me. The most deplorable human condition is to be bored, I think. Curiosity keeps us alive, honest, in pursuit of the truth and progress. Have you read any Studs? Where would you recommend starting?